Having been awarded my RPS Licentiateship for a panel consisting entirely of images of people and my RPS Associateship for a panel deliberately consisting entirely of images with no people in them, I decided to return to my favourite subject and started taking images of people again. My aim was to take candid shots which tell a story and I wanted to create images with an ‘artistic’ feel to them which could be considered as ‘Visual Art’ images. I also decided to enter International Salons and Exhibitions as a way to improve my photography as I felt that the discipline of entering these on a regular basis would help to prevent it drifting and falling down my priority list. 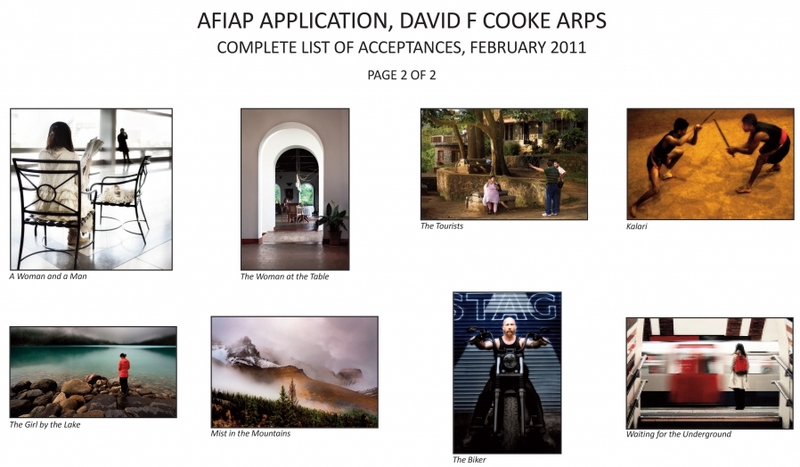 I like to have something to aim at so I also decided to work towards an international distinction, the AFIAP. in 5 (8) different countries. It all sounded very daunting when I started but it wasn’t as difficult as I feared. I got my first acceptance on 17th Oct. 2009 and I was awarded the distinction on 30th May 2011. Truly great images David, I like the ideas you have, and the Salon route is something I should try myself, as personal photography is not on the level I want.